A Garden of Remembrance was created in 1934 in a small fenced area near the Rectory Road entrance to Alexandra Park. This view looks north across the Garden of Remembrance to Rectory Road. The entrance to Alexandra Park is just off the picture to the right. In 1933 for Poppy Day, the Parks Committee had received a request to place a Field of Remembrance in the Park. Following the Remembrance ceremonies, a meeting of the Parks Committee on the 13th November recorded that the poppy crosses were to be moved to the base of the War Memorial. 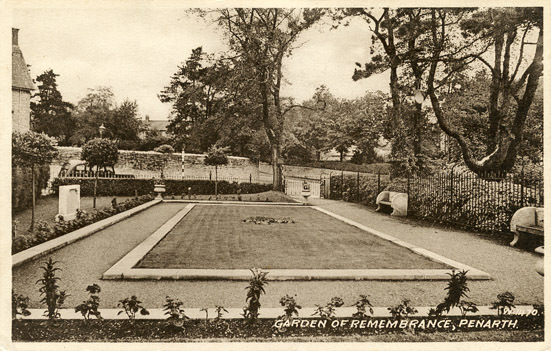 The construction of a permanent Garden of Remembrance was initiated by a meeting of the Public Works Committee on 24th September 1934 at which the Surveyor was instructed to approach the Plymouth Estate regarding a plot of land near the Rectory Road entrance to Alexandra Park. The plot in question subsequently was given to the Town by the Earl of Plymouth for the purpose of a Garden of Remembrance. All other expenses with the exception of labour were covered by donations from the people of Penarth. The Parks Committee in December 1934 decided that a tablet should be placed in the Garden of Remembrance to commemorate the opening. At the same meeting the Committee acknowledged the gift of a seat for the Garden. 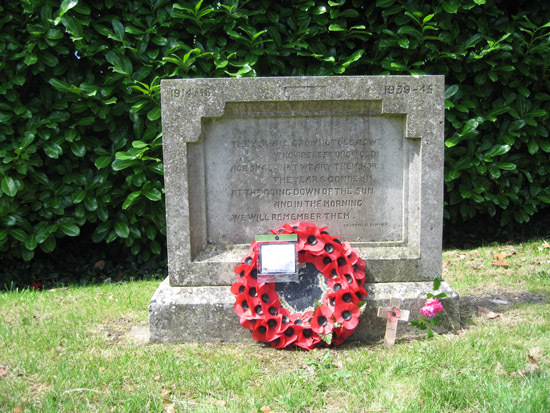 Also in December 1934 a second seat was donated by the local branch of the British Legion. The lettering 1939-1945 was added to the memorial stone in 1952 following a request from the Penarth Branch of the British Legion. In the present day Garden there is no trace of the "tablet" commemorating the opening, though it was probably present in 1968 when the Council instructed the Surveyor to re-letter the wooden plaque at the Garden of Remembrance. Until very recently the Garden consisted of a rectangular rather than three cornered lawn, with the memorial stone on its western side. In October 2012 the railings were replaced, the lawn was reduced and reshaped to provide a larger tarmaced area and the memorial stone and its base were renewed in the original location.